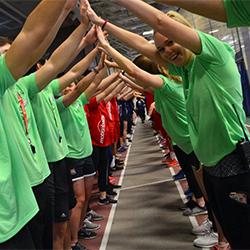 The first ever motionballU Marathon of Sport McGill was a huge success welcoming 7 teams of students and student-athletes for a fun-filled day of athletic competition! 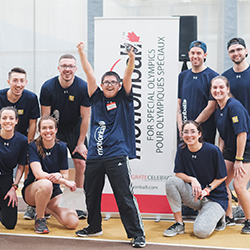 Students teamed up with local Special Olympics Quebec athletes and together, they competed in a variety of sports & activities! Thanks to the incredible support of these passionate students, we raised $3,600 net in support of the Special Olympics Canada Foundation! Click here to see photos inside the 2018 event! 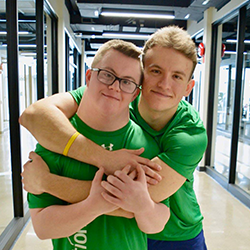 With your $20 registration, each participant will receive a motionball Under Armour T-Shirt, a Pita Pit Lunch and an awesome day of sport and celebration alongside local Special Olympics athletes! The 2018 motionballU Marathon of Sport McGill will run from 11AM – 3PM! Full schedule to follow! • Step #3 – Ready to register? Click here to email the motionball McGill Team to sign up as an individual or a Team. Limited Spots Available! Maximum of 12 teams! GIVING BACK HAS NEVER BEEN SO FUN!